Back in August of 2000 we signed a 10 year contract for four Club Seats in the under-construction new home of the Patriots, which after first being named CMGI Field, became known as Gillette Stadium. As I pass the time waiting for Super Bowl 46 tonight, I've been reminiscing. Our journey with the Patriots began with tickets to the AFC Divisional Playoff game on January 19, 2002. The final game at the old Foxboro Stadium. The game which came to be known as The Snow Bowl (or the Tuck Rule game for Raider's fans) and started the legends of Tom Brady, Bill Belichik and Adam Vinatieri. Lori passed on going so I got to bring three of my best friends. Lori never passed on another game. 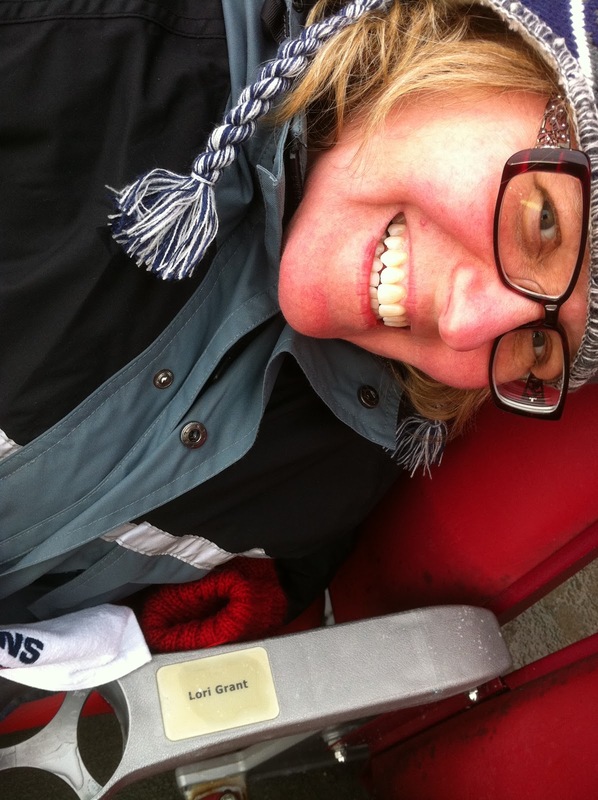 Lori says goodbye to her seat. Our final game was the AFC Championship game between the New England Patriots and the Baltimore Ravens on January 22, 2012. I really let all the details soak in since I knew it was our last game. Loved the "Go Pats" written on the belly of the transport plane that did the flyover during the National Anthem. The anthem was performed by Steven Tyler who then sat in owner Robert Kraft's suite, which was just over our head, and the big screen cameras found him every time an Aerosmith song was played during the game. He would get up and shimmy and sing along with the whole crowd - very fun. Another treat was the honorary captains - four of my favorite Patriots; Tedy Brushci, Drew Bledsoe, Troy Brown and Ty Law. They too all were in the owners box and anytime they stood up the crowd went nuts and the old familiar cheers of "DREEEEEEW" or "BRUUUUUUUSHCI" would erupt. I loved every time the Minutemen fired the muskets (took me a few years before that stopped making me jump, and I always enjoyed noticing opponents get freaked out by the guns). Also noticed how they started using more pyro for field goals once it became apparent how the game was going to unfold. We brought Larry The Lizard so he could enjoy his seat one more time and took pictures throughout the stadium. The Patriots have won every game he's ever attended. 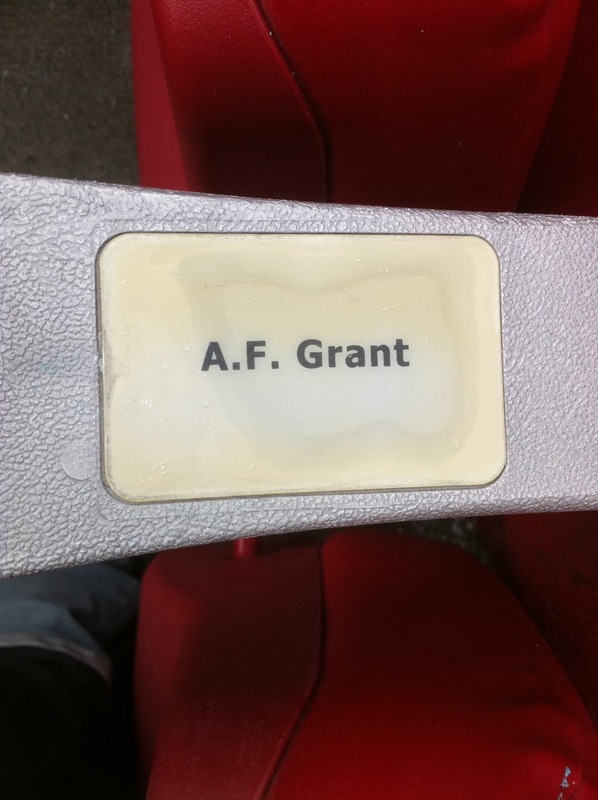 The reason my family of two bought four club seats was because that was the only way to guarantee Super Bowl tickets if the Patriots ever made it to the big game. So before the new stadium was even open we were able to go to Super Bowl 36 - the most amazing sports event I've ever attended. We went just hoping for a competitive game, we left with the foundation of a football dynasty. I still get chills watching any clip from that game. I thought it was a once in a lifetime experience. 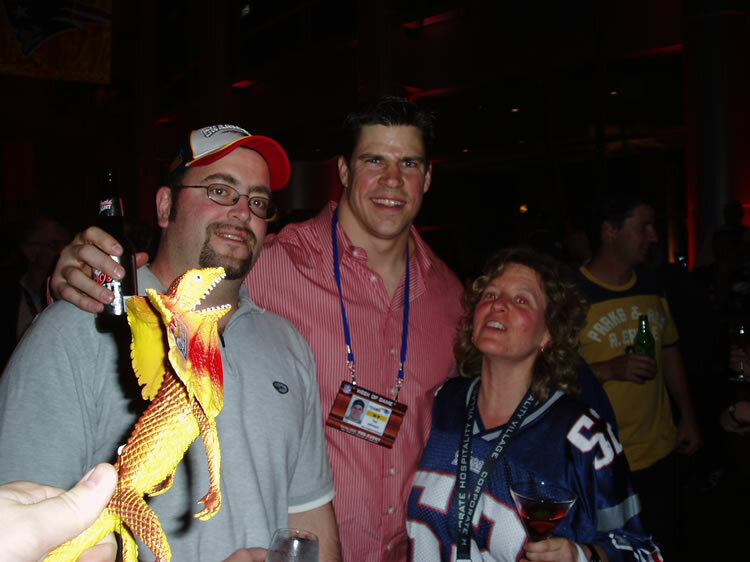 Then we went to Super Bowl 38, this time as VIPs with the team. We were guests at the Patriot's victory party following the game. AMAZING! Robert and Myra Kraft walked right by me with the Lombardi Trophy. We mingled with Willie McGinest, ( Willie's family sat a few rows in front of us at all the home games) Jarvis Green, Ty Law (he owned the two seats next to me for his last couple years with Pats), Matt Light... Lori got to meet her favorite player, Ted Johnson. Aerosmith and Kid Rock played live. And I'll never forget listening to Rodney Harrison telling the story of breaking his arm in the game but not being able to get off the field and having to make another play. I had a bad feeling in the undefeated season of 2007 and sold my tix to Super Bowl 42, very glad I did. I sold them to a friend who was a Giants fan, so I could at least feel happy for someone after the game. I feel so gross when forced to see clips from that game, but the Giants earned it. That David Tyree catch that I can't watch was awe inspiring. I am so grateful to the entire Patriots organization, the NFL (even when they threatened to sue me in 2006 for images on this very website), to Cisco stock for making it financially possible, the fans who sat around me, especially my boy Chuck Smith and his family who bought the four seats behind me and shared many games and two Super Bowl trips with us, to our friends and family we brought to games, to all those who bought tickets from me (I really like you, LOL), to the players families we got to know in the Club, for eight (I think) home playoff games, five Super Bowl appearances, seeing three championship banners raised, two live Super Bowl experiences, one undefeated regular season, and one totally sick Halloween/Anniversary party.... "WOW!" is all I can say. Still hard to believe. Ten years of Patriots games and they went to the Super Bowl five of those years. Stunning! Beyond all expectations. These are the good old days. How can it get any better than this?